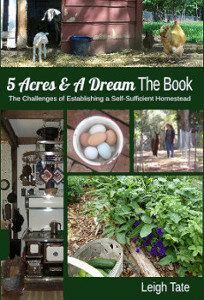 A lot of folks were interested in this so if you didn't win, please click on over to Amazon to get a copy. 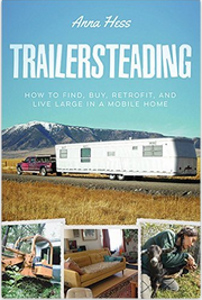 Trailersteading is reasonably priced in both Kindle and print and well worth it. Or, if your budget is too tight to do even that, request that your local public library buy a copy! That way, you can read it and others in your community can too. Tomorrow I announce the winner of the Trailersteading giveaway, but I wanted to sneak in a few of the latest baby goat photos. I can't wait too long to share because they grow so fast! Daphne and her baby boys at one day old. Now that they're dry, you can see their coloring a little better. Buckling #1 is mostly black, but like his mom, has a few white spots here and there. Couldn't get him to face the camera! Buckling #2 looks a dark silvery gray, which is actually a mix of black and white hairs (called "grizzled"). Now here they are in their little goat coats. The wind has been terribly cold so I'm happy that they fit. This is their very first outing at two days old. Meeting the other goats. This is B1 and Violet. I lament that my camera isn't good enough to get action shots. They look calm and still in these photos, but they are really very bouncy. The coats fit fairly well except that for newborn Kinder kids they don't need to be so long. Mamas identify their babies by smell, particularly their hind ends. When kids come to nurse she'll check to make sure it's her kids and not somebody else's trying to sneak a little milk. Also she keeps them clean back there, but so far so good. I actually made a knitting mistake and didn't add stitches to accommodate chest girth, but it this case it gave a better fit. Kinders are a midsize goat; smaller than standards but larger than miniature breeds. And of course, a piggy shot. They've been exploring their little barn but always come back to the sleeping pile. In the late afternoon the sun comes in through the door, so they're taking advantage of that. Next baby goat due date - April 6. I'm guessing that eliminating plastic for shopping (i.e. those ubiquitous plastic grocery bags) is one area where quite a few of us have made progress. 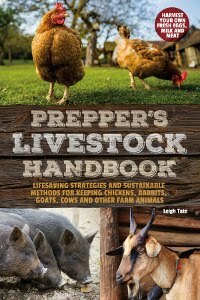 One of the cleverest ideas (for those of us who buy large bags of animal feed), are those homemade feedbag totes (instructions here). One of these days I'm going to make me some. In the meantime, I've kept cardboard boxes and fabric totes in the car for years. Recently I made some upgrades when I started solving my laundry plastic problems, but it started when my daughter-in-law gave me this roomy thermal tote as a gift. I've used it for transporting hot or cold foods. Pocket is handy too. I love it. So much lighter weight than the cooler I used to lug around for refrigerated or frozen items. In my part of the country, that is a must for summer shopping. straps. Katy snoopervises the putting away of groceries. & sturdy it is. The grommets really strengthen the straps. I'm very happy with them. They make all my old canvas totes seem dinky and flimsy. These are roomy and strong! The heavy webbing handles are reinforced with both stitching and grommets. What's really great is that once all the groceries are unpacked, they all squish up and fit inside the large tote. For me, that means it's easier to remember to put back into the car! For some reason my little cloth totes were forever getting pushed aside so that often they weren't where I needed them. I got two personal totes as customer specials, well, one tote and one purse. like that it holds pen and notebook so handily. Before I tell you where I got them, I have a confession to make. You probably noticed I don't do ads on my blog and don't even push my own books terribly often. But I did figure that if I was going to show these anyway, then I might as well set up the link to host a blog "party." If anyone orders, then I get credit for more products (and I have my eye on several things to help eliminate plastic storage containers). To check out the catalog, click here. You will land at a page entitled "Leigh's Online Thirty-One Party," and if you click "shop now," you can see what they've got. Better yet would be to host your own blog or facebook party so you could get free and discounted products. Just click on "Host a Party" at the top of the page, or email me and I'll put you in touch with my daughter-in-law. Another option: if you really like the products and are interested in a flexible home business that doesn't call for huge start-up capital, you could become a consultant. For more information click "Become a Consultant" at the top of this page or email me and I'll put you in touch with my daughter-in-law. One last consideration for eliminating plastic in shopping, is where you shop. One of the reasons I like Aldi is because they don't bag my groceries. I bring my own boxes or bags and eliminate those stupid plastic grocery bags. I mention that because some places I shop, I feel like I'm inconveniencing the checker because she has to take the time to use my bags instead of just pop my items into plastic. Your turn. Is shopping an area you've made plastic elimination progress? cranberries. Olive oil & balsamic vinegar dressing. Served with scalloped potatoes and ham. A wonderful winter meal. The first handle broke within the first month I had it. The others followed. All handles are broken, which makes it extremely difficult to carry to the clothesline. It's a piece of junk. Sure it could be recycled, but I'm also sick and tired of having to spend money on another limited-life plastic product every six months. I retired this one to simply holding dirty laundry in the laundry room. Wicker - prices seem to range from $80 to $250 for a good-size one. The only disadvantage to wicker is that it can mildew. Better for hampers and laundry storage. (Some nice ones here). Wood (woven) - some really nice ones here, and they say they're okay for carrying wet laundry out to the line. Prices for a good laundry-size basket are $65 up. Straw - the ones I found here are absolutely gorgeous but way out of my budget. Seagrass - don't know if these would mildew or not. $79 at PotteryBarn. While I was pondering all that, I received a Christmas gift from my daughter-in-law that was just perfect. "Deluxe Utility Tote," AKA my new laundry "basket,"
It's a water-resistant canvas tote made by Thirty-One. I was thrilled that it's large enough to hold a load of laundry from my washing machine. It has reinforced webbing shoulder straps plus hand-carrying straps on the ends (also reinforced). A wire frame is sewn into the top, so it stays open and keeps it shape. And it has pockets! What a relief to get rid of that plastic laundry basket. This got me thinking. My other problem was my clothespin holder. I used to have one of those fabric clothespin holders that can be hung on the clothesline. That one worked better when I had a long, classic clothesline rather than a space-saver umbrella style clothesline (because I kept having to relocate the pin bag). When the fabric wore thin and tore, I switched to a small repurposed, plastic tub. This worked for awhile. Eventually it went the way of all plastic. When DIL alerted me to a clearance sale, I took a look and I found a small tote I thought would work well for clothespins. I'm really happy with this one too. Meowy is frequently my laundry snoopervisor. "I'm bored with hanging laundry, yawn, wanna play?" would make a good clothespin holder. Like the laundry tote, it's made of water-resistant canvas, has reinforced webbing handles, and a wire ring to help it keep it's shape. The drawstring is handy to sling over my shoulder when going to or from the laundry room. Along with that, I got a small matching tote for miscellaneous laundry items. them up when I did, although they have dozens of other possibilities. I was on a roll now. The next thing to replace was that broken laundry basket which was still in use to hold dirty laundry. For that, I got the "Stand Tall Bin." tall. For me, this holds one load of dirty laundry. How much? Not as expensive as the options I listed at the beginning of the post, but they are still pricey. If ordered alone, the Deluxe Tote or Stand Tall Bin are each priced at $50. But! Thirty-One offers several ways to get discounts, and when I ordered it, I took advantage of one of those. Every month the company runs different customer specials. For every $35 (up to $105), I could qualify for one of those specials. (I know I'm going to sound like a commercial here - sorry! I'm really happy with these and want to pass on what I learned). When I bought the tall bin plus a tote for grocery shopping, I got two of these storage cubes for 60% off each. a variety of mix & match storage boxes for my sewing and knitting stuff. Averaging my total purchase with the number of items I bought made all of these items quite reasonable. Another way to get discounts plus free items is to host your own blog, website, or facebook sale. For example, if you click here, you will land at a page entitled "Leigh's Online Thirty-One Party." If you click "shop now," you can browse the catalog, get the specials, and I would earn credits toward free or discounted items. If you host your own party, you would be getting the credits. (Like the customer specials, the hostess specials change regularly too.) Just click on "Host a Party" at the top of the page, or email me and I'll put you in touch with my daughter-in-law. All I can say is, I'm very relieved to have replaced my laundry room plastic. Next week I'll show you some totes that I love when I go shopping. Okay, the floor is yours. Do you have plastic problems in the laundry room? What solutions have you come up with?